Having trouble with the Power Clean? Fix your form and technique with tips from STACK Expert Miguel Aragoncillo. Are you having trouble with theÂ Power Clean? Does it feel like your body is going to break if you add more weight? If so, chances are you are doing it wrong. The Power Clean is a complicated lift, but that's not an excuse for performing it incorrectly. If your form is lacking, you are limiting your potential power gains and putting yourself at a higher risk for injury. First you should refresh your memory aboutÂ how to Power Clean. Then you can address these common Power Clean technique mistakes and learn how to correct them so that you can safely lift more weight. 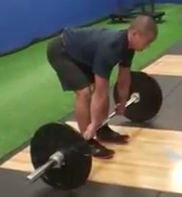 Are you having trouble with the Power Clean? Does it feel like your body is going to break if you add more weight? If so, chances are you are doing it wrong. First you should refresh your memory about how to Power Clean. Then you can address these common Power Clean technique mistakes and learn how to correct them so that you can safely lift more weight. Mistake: Initially driving up with your hips and following with your chest. This limits the amount of weight you can lift and can increase your chance of a back injury. Solution: Push your hips down and keep your chest up. Stay tall, keep your arms straight and drive up with your chest. Mistake: Muscling the weight up instead of launching the barbell up by forcefully extending your hips. Solution: After the first pull, when the bar is past your knees, begin to extend your hips while keeping the barbell close to your body. To learn this movement pattern, perform Hang Jump Shrugs as demonstrated in the video. Mistake: The barbell drifts too far away from your torso, forcing your arms to shift the weight into the catch position. Solution: Keep the bar as close to your body as possible. 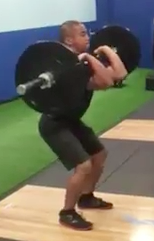 The momentum of the bar should come from the hip drive, not from pulling it up with your arms. As the bar comes up, pull yourself under it. Mistake: Attempting to catch the bar while your knees are too far forward or supporting the entire weight with your arms. Stiff upper back - perform thoracic extension and rotation exercises. Wrist issues during the catch - practice the clean grip by performing Front Squats. Knees shooting forward - explode up with your hips and shift your weight toward your heels.